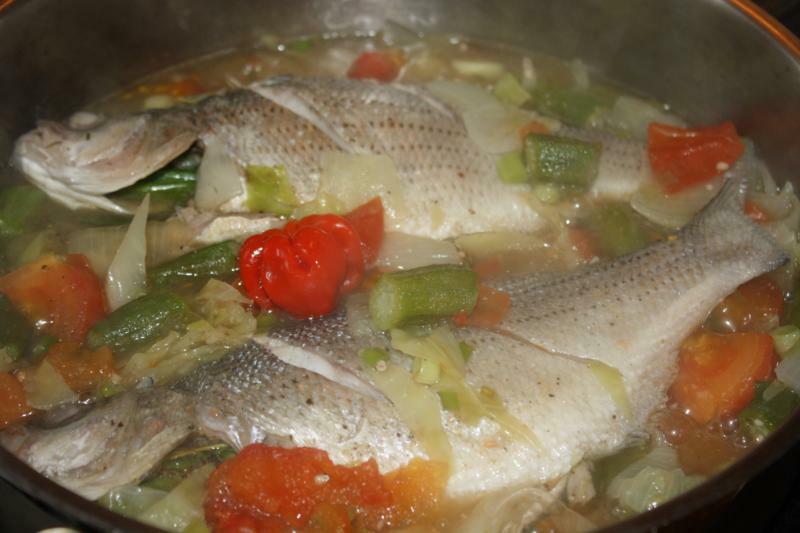 How to cook Jamaican steamed fish with okra and cabbage, one of the many popular fish dishes of Jamaica. Using this unique Jamaican recipe for cooking fish, not only is it very healthy, but rich is true Caribbean flavors. Usually paired with crackers and bammy (cassava flatbread) but it is great with rice. Steamed fish is a rich part of the Caribbean culinary landscape. "Start by heating the fish stock or water in a fairly large pan (one with a cover) and allow to simmer. If you can’t get fish stock, try to get a package or 2 of fish tea. I suppose you can use vegetable stock as well if you wish. To that we’ll add the ochro (okra) which we trimmed the stems off and cut in half. We also gave the onion a rough chop and added it to the simmering stock, as well as the chopped cabbage. Place the lid on the pan and allow to reduce for about 5-7 minutes on low heat. Place your fish in a large bowl, squeeze the juice of the lime or lemon over the fish, then rinse off with cool water and drain. We’ll now chop the scallions into halves, then keep the green ends about 4-5 inches or so and dice the remaining pieces. Fine chop the 1/2 of scotch bonnet or habanero pepper and rinse off the thyme under cool water, but keep intact (on the sprig). You’ll notice that I trimmed the gills, fin and tail off my fish. If your fish is not cut down the middle of the belly, do so, so we can stuff it with the seasoning. Take about 3 sprigs of thyme, 1/2 of the scallions (greens), 1/2 of the chopped scotch bonnet pepper and a dash of black pepper and stuff the cavity of each fish. In the pics you’ll notice that I forgot to make a couple cuts along the sides of the fish (I did so later on). Please do so now so the fish will cook faster and the flavors will absorb nicely into the fish itself."